Listed in: Accessories, Gowns, Hair, Headpiece, Make-up and Veil categories. Get more for your wedding! 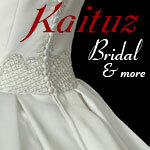 Don't forget to mention ChossonKallah.com when visiting Kaituz Bridal & more.